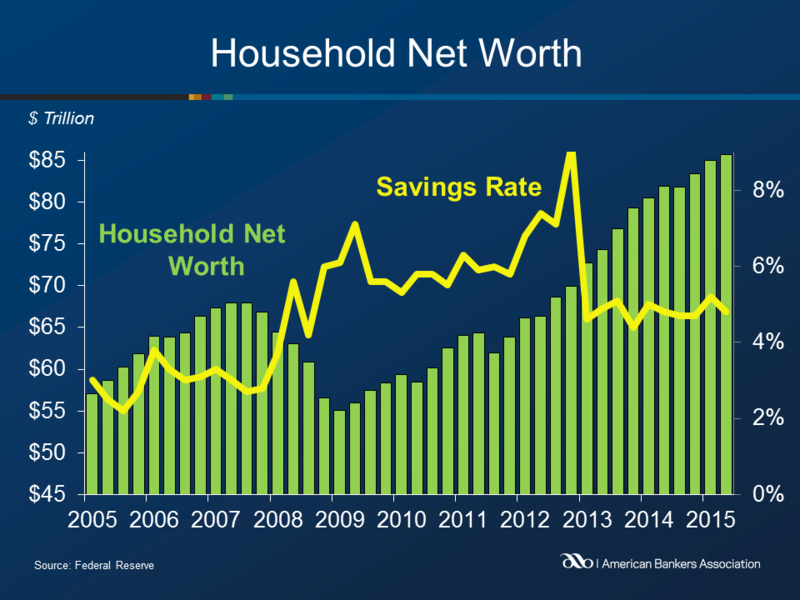 Household net worth increased $694.8 billion during the second quarter of 2015 to $85.7 trillion, a 0.8 percent increase from the first quarter, and a 4.6 percent increase from a year ago. Households’ holdings of nonfinancial assets increased during the second quarter, growing 1.9 percent. The majority of this increase came from real estate holdings, which increased by $498.7 billion. Growth in wealth derived from consumer durable goods nearly doubled from last quarter’s increase, adding $70.2 billion. Household financial assets increased 0.4 percent from the previous quarter, and 3.4 percent from the previous year. The quarterly growth was driven mostly by increases in deposits, debt securities, loans and mutual fund shares. Household holdings of corporate equities declined. Household nonfinancial debt increased at an annual rate of 3.9 percent in the second quarter, as consumer credit grew 8.1 percent. Mortgage debt grew at a 2.2 percent annual rate. The household savings rate fell to 4.8 percent in the second quarter, down from 5.2 percent in the first quarter, but unchanged from 12 months ago. Nonfinancial business debt rose at an annual rate of 8.3 percent, a larger increase than last quarter’s 7.2 percent increase. The majority of nonfinancial business debt was concentrated in corporate bonds. Federal government nonfinancial debt increased at rate of 2.4 percent, after decreasing at a 1.1 percent rate last quarter. State and local government nonfinancial debt increased at an annual rate of 1.0 percent, down from a 4.3 percent rate in the first quarter.